AMARILLO, Texas – “Amarillo by Morning” takes on new meaning for these hikers on the Wildcat Bluff Trail as they enjoy a brilliant sunrise over the high plains of West Texas. 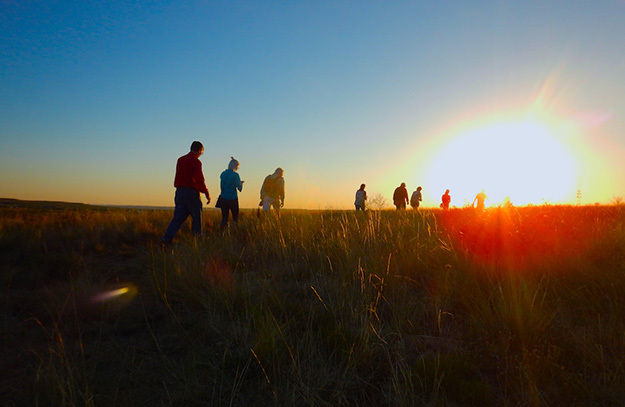 A sunrise hike on Amarillo's Wildcat Bluff Trail - Image by Tom Adkinson. The trail is part of a five-mile system that winds through 640 acres of the high plains prairie ecosystem at the Wildcat Bluff Nature Center. The landscape, while basically flat, actually offers gently rolling meadows, mesas and the location’s prominent namesake, Wildcat Bluff. A special feature is Libby Trail, a meandering, accessible paved route measuring 2,000 feet and including a manmade spring-fed oasis that adds birds, fish and amphibians to the list of wildlife you may see. Wildcat Bluff Nature Center, which is funded entirely by private donations, keeps its trails open every day of the year. You may catch a glimpse of downtown Amarillo on the horizon, but you’re more likely to let your imagination carry you back to earlier times before mankind had any lasting effect on this relaxing environment.